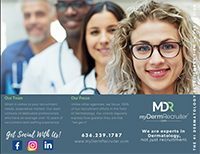 myDermRecruiter - Looking to Hire? Our experienced team of consultants is ready to assist you. We help you keep up with the competition. As recruiters who are 100% dedicated to Dermatology, we understand your search like general recruiters can't. We know the nuances of regional and national hiring trends in Dermatology, and we can provide you with insights to ensure your practice is offering a package that is attractive and highly competitive to candidates you want to hire. We have the resources to match you with top talent. Due to aggressive advertising power and an unmatched database of candidates who are actively and passively seeking new dermatology careers, we offer incredible visibility for your opportunity. We put your opportunity in front of the eyes of every qualified candidate we can via our proprietary database, multiple physician job boards, direct email campaigns, social media posts, attendance at American Academy of Dermatology meetings and more! Not to mention the direct relationships we have built with providers across the country who are passively looking for their next great career opportunity, and utilize our services exclusively to keep their search confidential. We get to know exactly what you expect in a recruitment partner and a candidate, then we work every day to meet those expectations. We spend the time upfront to learn your preferences, culture and vision for your practice to ensure a perfect match in a candidate. Our advertising power is unmatched due to our proprietary database of dermatology providers nationwide, who are actively and passively seeking a Dermatology career. We can literally put your opportunity in front of the eyes of every candidate we know across the country via job posts, email campaigns, social media and more. Our comprehensive database contains direct, personal contact information for experienced dermatology physicians, advanced practice providers, residents and fellows across the country. We are able to reach candidates personally, ( via email & cell phone) ensuring your opportunity is seen and heard about by prospects who may not be utilizing job boards to find their next position, or want a more confidential approach. Once we get a candidate excited about and interested in your position, we properly and professionally screen them to ensure they are a fit to your opportunity. Through our extensive screening process, we filter out candidates who simply don’t match up to your culture or mission before we ever submit them for your review; saving you a frustrating and expensive interview process, only to find out on the site visit, this isn't a match. We have frank, personal discussions with candidates to ensure that there are no surprises for you! We send you a complete and formal "Biography & Submittal" on every candidate. This includes everything we know about that physician; why they are interested in your opportunity, why they want that location and when they can interview and start after accepting an offer. Everything we know, you will know. We stay connected without bugging you when we don’t need to. When you hear from us, it means we have a candidate interested and ready to learn more about your opportunity asap! We have built great relationships with our clients nationwide through our no-nonsense, respectful yet personal approach to client relations, and over 75% of our clients are repeat clients! Interested in learning more about our services? Register below and one of our talented recruiters will reach out to you directly. In addition to recruiting talent for your practice, we also help you develop and maintain an online marketing strategy that will drive both patients AND providers to your practice.